Please use the form below (1 business day turnaround), or call the Service Desk at 924-5444. 13 meeting/study rooms which are available to patrons who hold a valid Health System ID. These rooms can be used for formal classes, small conferences, meetings, and studying in groups. Each room can accommodate up to 15 individuals. Some rooms can open to accommodate up to 30 individuals (suitable for classes). All rooms have network connections, LCD screens, white boards, and computers with EPIC. Patrons already in the library can make same day reservations at the Service Desk or by using the Self-Reservation feature on the touch screen display monitors next to each room. A HIPAA compliant UVA Health System telemedicine system. A UVA Health Information Technology Department computer. A web conferencing camera and audio system for web-based conferencing. A UVA ROLM telephone with a speaker. 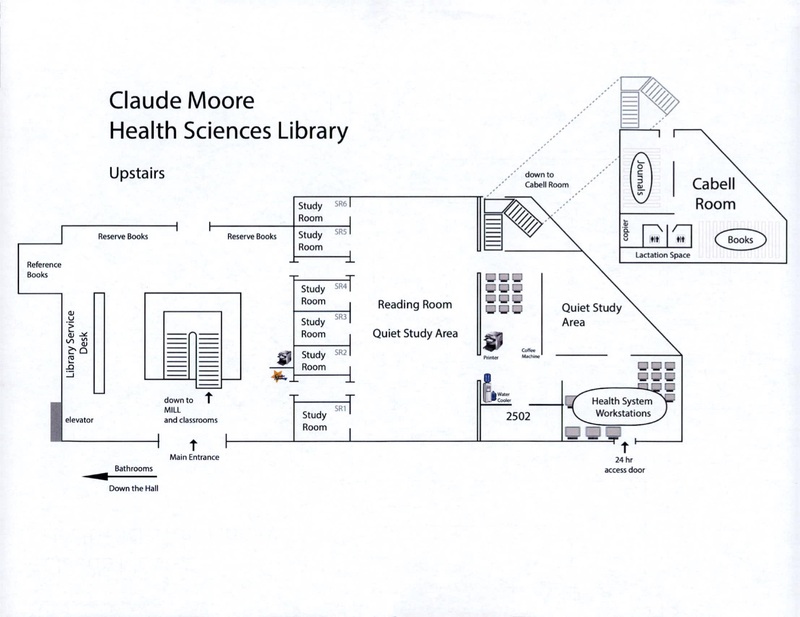 Faculty, staff, and students affiliated with the University of Virginia Health System may reserve rooms for meeting and collaborating. Rooms are intended for scheduled meetings or other group related activities. They may not be used as a substitute for regular office space. The library reserves the right to make a determination if reservations are consistent with intended use. Patrons using rooms without a reservation should check the reservation screen and note the time when a room needs to be vacated. Reservations will always receive priority. It is encouraged for all users to make a reservation for the room they are using. 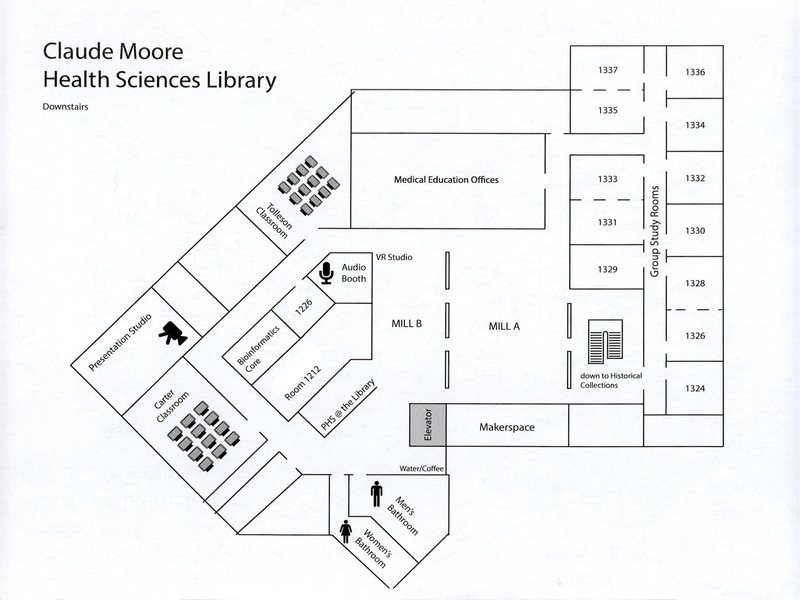 Patrons already in the library can make first floor meeting room reservations at the Service Desk or by using the Self-Reservation screen located outside each room. Individuals or groups may reserve rooms for a maximum of 3 hours per day. Exceptions can be requested at the Service Desk or by calling 434-924-5444. Rooms not used within 20 minutes of the scheduled reservation start-time are considered vacant and will be available to others on a first-come, first-serve basis. Meeting attendees may bring items for personal consumption (e.g., drinks, snacks), and some catering options are permissible. Please see the Food and Drink Policy for details. Specific room assignments may be determined by the size of the requesting group. While particular room preferences may be considered, the Library staff makes final room assignment decisions. First Floor Group Classrooms: These classrooms were designed to support the educational mission of the SOM. SOM receives first priority for reservations. If no reservations have been made, others may reserve these rooms up to 6 months in advance. 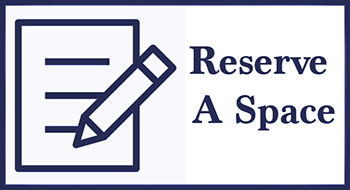 Recurring Room Reservations: Room reservations and recurring reservations are handled promptly and in the order that they are received. Reservations can be made up to 6 months in advance. Recurring reservations for an extended or indefinite period of time (exceeding 6 months) will be handled on a case-by-case basis. Our study rooms are perfect for independent or small-group quiet study. Each study room is equipped with a table, chairs, and a white board. Study rooms 1 and 2 have wall monitors which can be used to connect to laptops. You can also reserve these study rooms online through the Self-Reservation System. The Detmer Room has a large wired table that will seat 10-12 people. This room has a white board and a large LCD monitor to connect to your laptop. You can also reserve the Detmer Room room online through the Self-Reservation System. Patrons using rooms without a reservation should check the reservation screen and note time room needs to be vacated. Reservations will always receive priority. It is encouraged for all users to make a reservation for the room they are using. First Floor Group Classrooms: These classrooms were designed to support the educational mission of the SOM. SOM receives first priority for reservations. If no reservations have been made, others may reserve these rooms up to 6 months in advanced. There are two computer classrooms used for instructional purposes. When not in use for instruction, the computers can be used by patrons. Computers are not Health System computers and do not have EPIC access. Classrooms are available during staffed hours. Faculty affiliated with the Health System may reserve up to 3 months in advance. Curriculum-based instruction is given priority. Reservations requiring more than 5 hours a week will be handled on a case-by-case basis. Understand classroom equipment and teaching software. Please make an appointment with a Library IT staff member for basic classroom orientation. Leave the classroom as it was found. Report technical problems to the Service Desk for resolution. We are not able to support the use of library computers for examinations due to the complex nature of examination software, hardware, and procedural requirements. MILL A & MILL B are open-concept spaces with tables, chairs, monitors, and whiteboards- all on wheels- that users may customize according to their needs. MILL A & B may be reserved for your event. The makerspace represents a partnership between the Library and BME. Some of its resources include: a 3D printer and computer; cardboard; a map of makerspaces around Grounds; and small manipulatives such as LEGO and pipe cleaners. The Virtual Reality space provides a dedicated, permanent home for the Library's VR sandbox. Our VR resources include both wired and wireless headsets, and a computer which provides access to STEAM and YouTube VR. This space may be reserved. The Audio Booth is a standalone, soundproof environment equipped with a computer, monitor, microphone, desk, and two chairs. The software installed on the computer allows users to narrate slides and movies, create screen-captured tutorials, record podcasts, and enable private videoconferencing. The Audio Booth may be reserved. The Studio is a small-scale film studio equipped with green screen, lighting kit, digital video camera, and computer with editing software. The Studio may be reserved. The MILL is a community space which hosts a large number of people each day, and so whiteboards are erased every morning to make way for new thoughts and ideas. Food and drink are permitted. If you are having an event catered, you are responsible for all arrangements, including setup/cleanup.